Better than the “Bake Off” final? We know Tuesday nights are for the Great British Bake Off and nothing else, and we know that last Tuesday was none other than the GBBO final, but we had very important work to do, so we had no choice but to make our excuses to Paul “Blue-eyes” Hollywood and the lovely Mary and go and bake up a bit of a storm ourselves. What rebels we are! The awesome people (thank you Catherine Conway!) at Unpackaged leant us their equally awesome space (seriously, if you haven’t been there, you need to go!) 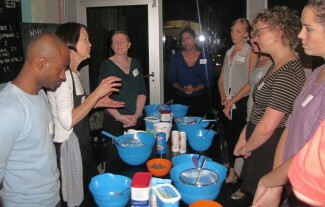 so that we could hold a special “train the trainer” event for seven of our interested bakers. Remember we told you about that grant Hackney Council had given us? Well this is where it comes into play. The idea – the dream, if you like – is that we train some of our bakers to be able to teach some of the local parents and children that we work with to be able to bake. We’re not doing it so that our local families stop coming to us for birthday cakes. This is about giving families the skills (and basic equipment/ingredients) to be able to do a fun activity together. Baking: it makes people happy. Eating cake does that too, but eating home made cake is even better. We were very lucky to be able to work with Julia Chalkley – a freelance cookery teacher, who teaches all ages, which is just as well really as she was teaching us adults how to teach kids how to bake. And it seemed to work. 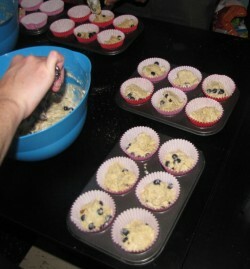 Julia whipped us all into shape and we managed to produce some very decent batches of very delicious blueberry and yoghurt muffins. But, not only that, we learnt how to structure the time when we run our own baking workshops, and how best to show others, who are unlikely to have ever baked before, how to bake in a way that makes it easy, enjoyable and encourages them to go on to bake again. It was enlightening and we had loads of fun, and our bakers are lovely (even if we do say so ourselves, and even if we may have mentioned it one or two times before)! So we missed the Bake Off final, but we can catch it on iPlayer and we still know that Frances rocked it (of course she did – remember those bread sticks made to look like matches?!). And it was so worth it. 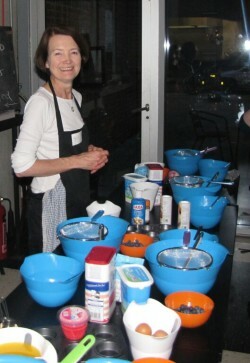 We met bakers, we ate muffins, we cooked and learnt and are now raring to go with our own baking workshops. The first is at Morningside Children’s Centre in just a couple of weeks. We will, of course, report back here… Wish us luck!